Takeaway: Taking 10 minutes to start your day with these poses will wake up your spine, getting you physically and mentally ready to face whatever the day brings. Most of us don’t have time to practice a full hour of yoga in the morning before shuffling the kids off to school or scooting out the door for work. Sometimes we barely have time for a nice coffee, a hot shower or ample time to get ready, depending upon our busy schedules. However, taking just 10 to 15 minutes each morning with the following five yoga asanas will get you going naturally and might even replace your morning coffee. A morning yoga practice is one of the healthiest ways to start your day, and if you can get into the routine of moving your body and breath during this dawning of the day, you’ll be oh-so-happy you did. Sufi grinds are really good for the spine, the hips and also for your digestive health. Most of us need a digestive boost as the day begins and this pose is perfect for that. It helps relieve stress and relax the entire system, while relieving constipation, if that’s an issue. For the sufi grinds, we sit in a cross-legged position with our hands taking hold of our knees. We then begin to rotate our torso in a clockwise direction. Take as big or as little circles as feels right for you. Imagine that you have a poll in your center which you’re rotating around. 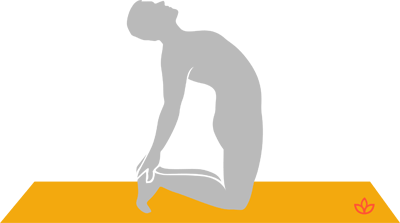 Allow the head to remain centered, directly above the neck and spine. Your inhale takes you around the front of the circle while your exhale takes you around the back of the circle. You can do this asana while closing your eyes and focusing on your third eye. After moving one way for a couple minutes, change direction to rotate in a counter-clockwise direction. Sufi grinds are a truly brilliant way to kickstart your day. The ancient yogis believed that the health of the spine was central to longevity. In modern-day yoga, we still follow this recipe for a long, healthy life, which is why moving and stretching the spine early in the morning is a really good idea. Cat-cow pose is the perfect spinal stretch to begin with because it’s both gentle and effective. We can also link our breath to the movement in this pose — inhaling as we arch the back into a cow-like position, and exhaling as we round the back into a cat-like position. The addition of the breath helps get our prana, or life force energy, flowing throughout, which is essential for harnessing your energy for the day. By this time, you’re warmed up enough to come into downward-facing dog pose. We all love down dog because it feels good. Why? Because you’re stretching and elongating the spine while strengthening your arms, legs and entire torso. Down dog is like a full body workout while remaining gentle and easy on the body. It's a great energizing pose for the early morning and you can hold the pose for as long or as short as you like. Just focus on taking long inhales and long exhales to get the prana flowing freely throughout your subtle body. After downward-facing dog, camel pose is the perfect counter pose. It’s also a nice backbend and heart opener to begin the day with because it can be modified if your body isn’t totally warmed up just yet. This chest-opening asana clears and frees up energy in the throat and also the area of the chest and heart center. To make the pose a bit easier for the early morning, simply lean your body into a backbend without going all the way back into the posture. You can place your hands on your lower back for support as you look skyward, arching your back into a backbend. You also get a good stretch in the legs in this asana. Camel pose tones the entire body while giving your mind a wake-up call. This an amazing twist for a good stretch to stimulate the digestive system, always a good thing in the morning. 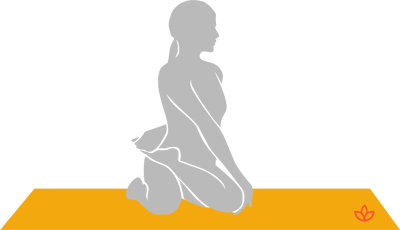 The seated spinal twist version is gentle enough when you’re first getting going. A lot of us feel tense in the morning, especially if we don’t have much time to focus on self-care. This yoga asana wrings the tension out of us, making it the perfect preparation before a potentially stressful day at work. The beautiful thing about yoga is that it invigorates and energizes you —unlike most other workouts. Just 10 minutes each morning goes a long way. Allow these poses to kickstart your morning in a quick, well-rounded way.